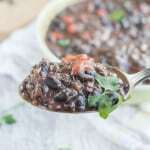 Cuban black bean soup recipe – Treat yourself this winter to some warm and hearty slowly cooked black bean soup that is totally vegan friendly. If you’re a fan of legumes and pulse like I am then you’re in the right place at the right time. Beans or peas as we like to make reference to them in the English speaking parts of the Caribbean, play a central role, whether you’re from a Spanish, English or French island that fondness never seems to disappear. 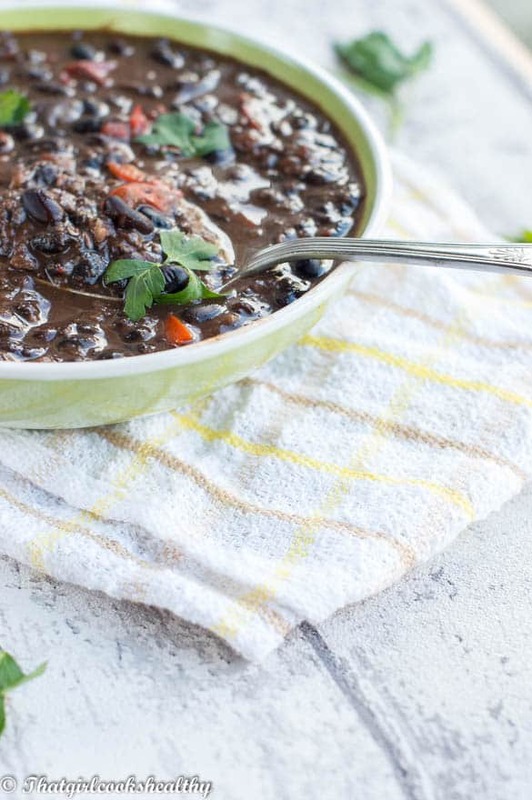 This Cuban black bean soup recipe is so flavourful, vibrant and a nice way to transition from winter to the beginning of spring as the temperature isn’t quite T shirt weather. This was another recipe that I often turned to during the harsh winter time, only I didn’t quite perfect it over the season. It look many attempts of trial and error and having my family critique it. Just when I thought I had this one in the bag, a relative commented ‘it’s nice but needs more flavour’. 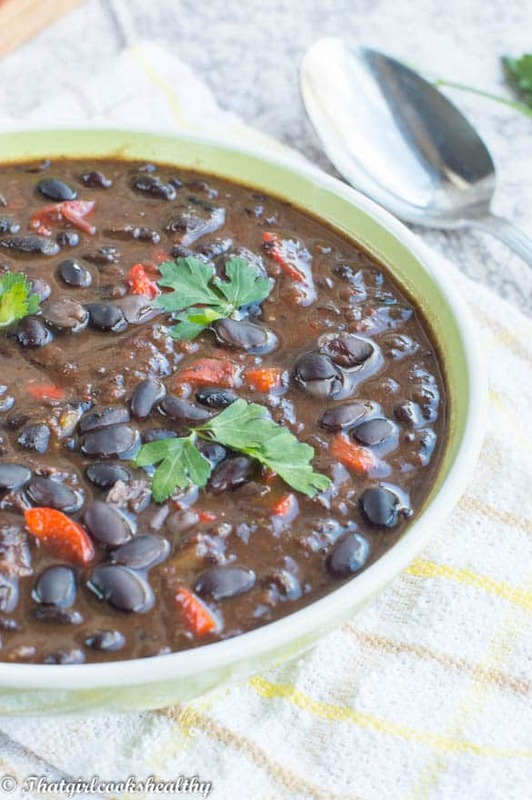 What is Cuban black bean soup? In short it is a warm and hearty soup made from legumes, black beans to be precise. The soup is slow cooked and typically made with ham hock. Now I will be honest here this isn’t a 15 minute ready meal, the overall cooking process will take a few hours because true black bean soup is a slow cooking process so the flavours permeate and also to allow the beans to break down slowly. Keep in mind that this is a vegan version of black bean soup, so pork is excluded. My family are probably the only people of Cuban ancestry who don’t eat pig, strange but true. The meat substitute – I replaced the meat with vegetable stock to form as the foundation for the soup. Sofrito is a must – I also made sure to include sofrito which is a popular pureed base/flavour enhancement made from many different vegetables. The English version of this is called greening seasoning and Haitian refer to it as Epis. 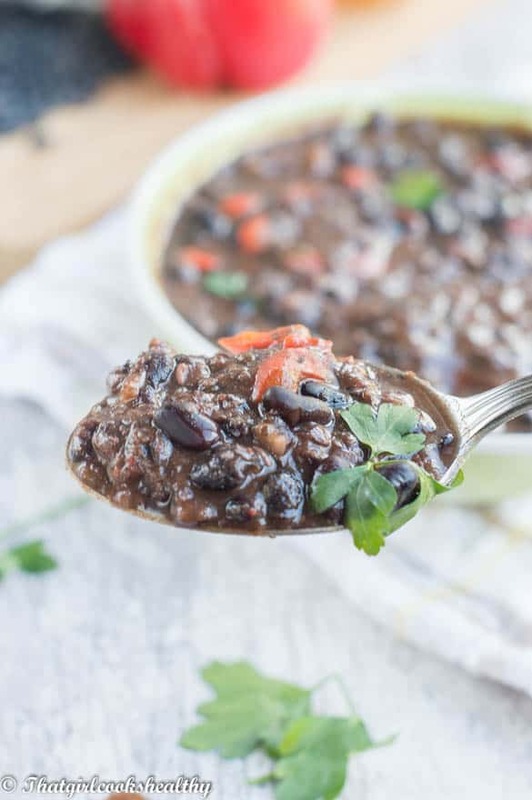 The secret ingredient is……..There’s a secret ingredient, that many people totally bypass with Cuban black bean soup is apple cidar vinegar and sugar (palm sugar in my case). It all may seem a little bizarre but this yields a wonderful sweet and tangy note right towards the final stages of the prep work. Soak the beans – You will need to let the beans soak overnight, rinse them firstly and then soak in 4-5 cups of water. The colour of the water will deepen with time, don’t be alarmed this is normal, you’ll be using the water to boil the beans. Tying herbs and veggies together for flavour – A cheesecloth is needed to house the bay leaf, onions and green peppers. During the initial stages we want the flavours to permeate from the very beginning until the last stages of cooking, that’s the correct order of things. Once boiled discard the contents from the cheesecloth and focus on making the sofrito. This is another element to the black bean soup, one that provides the herbaceous flavour. Cubans usually include cubanelle peppers, which look similar to scotch bonnet without the heat and slightly elongated in shape. As I wasn’t able to get hold of them I opted for some sweet red pepper. Pulse a portion of the beans – Another thing you’ll need to do after preparing the sofrito is use an immersion blender to break down the beans. Pulse no more than three times in total as the beans will fall apart during simmering. However, this step will give the soup a head start. The simmering stage is the final leg of the cooking process and the best part for sampling your hearty soup. Add your extras – roasted red pepper, vinegar and coconut palm sugar, pink salt and black pepper. As the additional condiments are added, it’s safe to put the lid of the pot and simmer down to a texture of your desire. 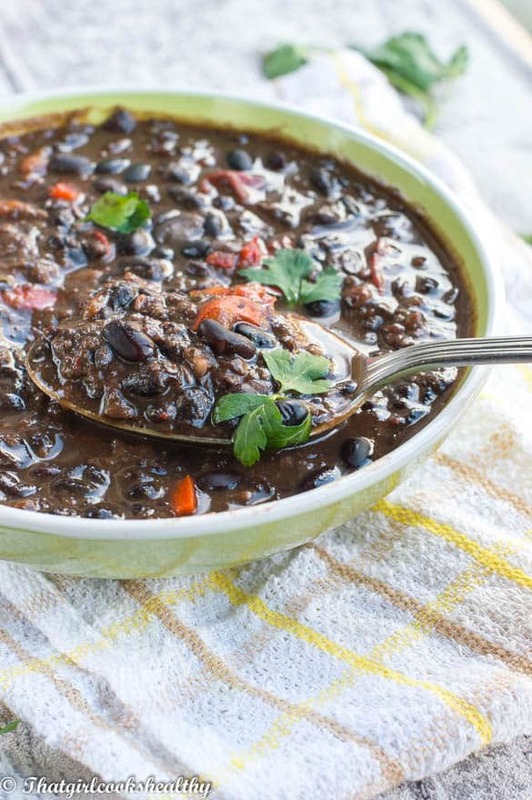 You should make this Cuban black bean soup recipe because……. It’s gluten free and vegan!!! Rinse the black beans and soak them in the 5 cups of water overnight in a heavy duty stock/soup pot. Bring the beans to a boil with the water on high heat. The colour of the water should be a dark hue, this is normal. As the water beings to boil, reduce the flame to medium. Add all the ingredients referenced above into a cheesecloth and tie into a tight knot then drop this into the pot, carefully. The beans should be cooked until tender, this should take 1hr 30minutes. Replenish with water if the water levels drop drastically, a cup at the maximum should be enough. Once cooked, add the 2 cups of vegetable stock and remove the pot from the heat. Discard the mushy ingredients from the cheesecloth. Prepare the sofrito by adding the coconut oil to a small frying pan on medium heat. Sauté the minced garlic and onions for 1 minute then add the peppers and stir in the cumin and oregano. Continue to cook for another 2-3 minutes. Pour the minced mixture into the soup pot and stir. Use an immersion blender and pulse the black bean soup no more than three times, it will break down further with time. If you don’t a immersion blender, ladle a cup worth of beans and puree in a food processor/conventional blender. Reheat the soup on medium heat, then reduce to low after 2 minutes. Finally, add the vinegar, palm sugar and pink salt and pepper, season to taste. Remove the bay leaf and serve with a dollop of dairy free sour cream. Your recipe is suggesting that we boil the beans in the soak water. I believe it would be much more prudent to discard the soak water, and boil them in fresh water, just to remove the oligosaccharides. Yes, in Caribbean recipes that require the darkened hue from the beans, you rinse the beans several times and then use the same water after soaking them. Of course this can be a problem for people with severe digestive disorders. My only suggestion in terms of eradicating the oligosaccharides is to switch things up a little. Soak the bean for 4 hours instead, discard the water around 2-3 hours as this should have eliminated most of the indigestible sugars, soak for a further 1-2 hours max then boil the beans. 1-2 hours should give the beans enough time to regenerate a dark hue, yet rid most of the oligosaccharides, since the dark brown colour is key to specific Caribbean cuisines including this one. That dark hue cannot be bypassed hence the name black bean soup but can certainly be achieved using the aforementioned steps. I’m going to try this recipe, too! I live in New Orleans, and the city’s famous red beans and rice won’t come out red if you throw away the soak water. That said, I will cook my black beans as you’ve instructed–IN the soak water! Thanks again…your website is great! Hi Jan. I’m so envious right now! New Orleans is the motherland for creole food. Yes the water from the beans in so essential for the hue of the dish. There is no black bean soup without the bean water.